A learned rabbi, probably of Spanish origin; lived in Italy during the first half of the sixteenth century; died about 1550. The data given by writers who mention him are conflicting. The earlier bibliographers, Bartolocci ("Bibliotheca Rabbinica," Nos. 44, 80, 107) and Wolf ("Bibl. Hebr." i., No. 100), confound him with Abraham of Pisa. 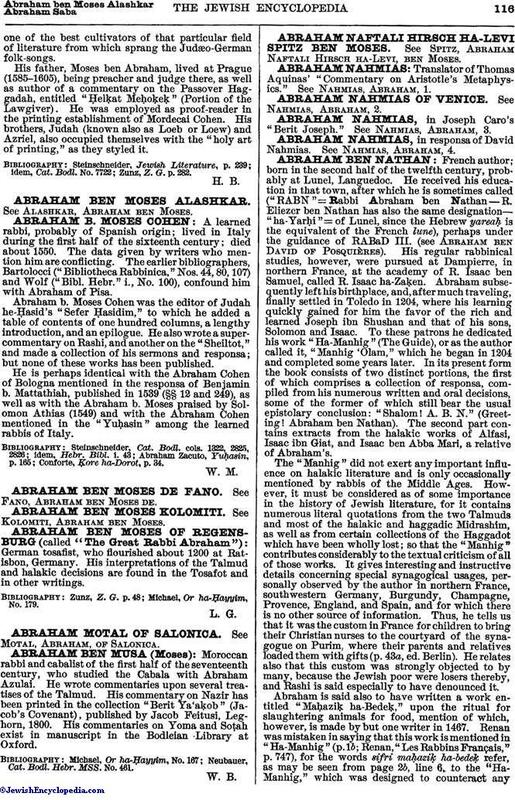 Abraham b. Moses Cohen was the editor of Judah he-Ḥasid's "Sefer Ḥasidim," to which he added a table of contents of one hundred columns, a lengthy introduction, and an epilogue. He also wrote a super-commentary on Rashi, and another on the "Sheiltot," and made a collection of his sermons and responsa; but none of these works has been published. He is perhaps identical with the Abraham Cohen of Bologna mentioned in the responsa of Benjamin b. Mattathiah, published in 1539 (§§ 12 and 249), as well as with the Abraham b. Moses praised by Solomon Athias (1549) and with the Abraham Cohen mentioned in the "Yuḥasin" among the learned rabbis of Italy. Conforte, Ḳore ha-Dorot, p. 34.